Food pests, also known as pantry pest, such as the Indian Meal Moth and the Red Flour Beetle get into food stuffs and lay hundreds of eggs. These eggs hatch into larvae which consume the food stuffs, leaving their waste behind them. 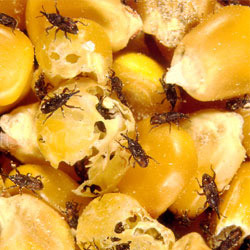 You can do a great deal to reduce these pests by throwing away infested food products. AmeriGuard’s Pantry Pest Defense Service begins with a licensed technician providing a full inspection of your home. During the inspection, your technician will identify all food pest problem areas as well as potential food pest harborages. Special attention will be paid to cabinets and other areas food products are stored. Cigarette Beetle – feeds on cured tobacco, cigarettes, and cigars. It also feeds on dried herbs, spices, nuts, cereals and cereal products, dried fruit, seeds, and animal products such as dried fish and meats, hair, and wool. This beetle is most commonly found in pet foods, cereals, nuts, and candy. It may also infest dried pepper arrangements, wreaths, and spices such as chili powder or paprika. Confused Flour Beetle – consumes a very wide food range including cereals, damaged grains, grain products, shelled nuts, dried fruit, chocolate, drugs, and herbarium and museum specimens. Drugstore Beetle – feeds on cured tobacco, cigarettes, and cigars. It also feeds on dried herbs, spices, nuts, cereals and cereal products, dried fruit, seeds, and animal products such as dried fish and meats, hair, and wool. This beetle is most commonly found in pet foods, cereals, nuts, and candy. It may also infest dried pepper arrangements, wreaths, and spices such as chili powder or paprika. Indian Meal Moth – larvae attack a wide range of products, including cereal products, flour, cornmeal, rice, dried fruit, dehydrated vegetables, nuts, chocolate, candies, and other confections. Merchant Grain Beetle – larval and adult stages feed on all food of plant origin, especially grain products like flours, meals, breakfast foods, stock and poultry feeds, coconut, nutmeats, candies, and dried fruit; it is not uncommon to find these beetles infesting pet food, bird seed, and rodent bait. Red Flour Beetle – consumes a very wide food range including cereals, damaged grains, grain products, shelled nuts, dried fruit, chocolate, drugs, and herbarium and museum specimens. Saw Toothed Grain Beetle – larval and adult stages feed on all food of plant origin, especially grain products like flours, meals, breakfast foods, stock and poultry feeds, coconut, nutmeats, candies, and dried fruit; it is not uncommon to find these beetles infesting pet food, bird seed, and rodent bait. Warehouse Beetle – feeds on a wide variety of foods including cereals, candy, cocoa, cookies, cornmeal, fish meal, pet foods, flour, nuts, dried peas and beans, pastas, potato chips, spices, dead animals, and dead insects. We recommend thoroughly cleaning all affected areas and disposing of all infested food stuffs prior to your pantry pest service. Vacuum the pantry and shelving to ensure that all food particles are removed prior to treatment. New food products should be stored in sealed containers instead of the original packaging to prevent future pantry pest infestations. If pantry pests are still present after a thorough cleaning of the infested area and after the infested food items have been removed, AmeriGuard will treat for pantry pests using a crack & crevice chemical treatment application to ensure that all pantry pests are thoroughly eliminated.